Creating a niche of Drawer Lock such as Front Mount Multi Drawer Lock and Side Mount Multi Drawer Lock at its best, with utmost quality. Our team is delicately engaged in the process of manufacturing and supplying a range of Front Mount Multi Drawer Lock. Offered product is used to install in drawer for locking purpose. In order to manufacture this product, we use high quality raw material procured from reliable sources in the industry. Apart from this, we offer this product at most acceptable price range to our precious clients. Owing to our expertise, we are manufacturing and supplying a wide assortment of Side Mount Multi Drawer Lock. This is manufactured using high grade raw material as per the set industry norms under the supervision of skilled professionals. To meet various needs of the clients, we offer this product in various dimensions. Furthermore, the offered range is tested on various parameters of quality in order to deliver flawless range at the clients’ end. 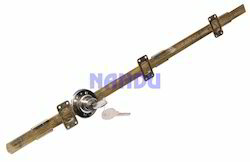 We are reckoned as prominent entity of supreme quality Drawer Lock. The offered heavy duty locks are trusted widely for its versatility. It is a side mounted lock used for furniture and drawers. These locks are developed with sophisticated technology and presented with computerized dimple key. Further, our prestigious clients can avail the highly reliable drawer lock from us 19" (3D) and 23" (4D) sizes at a competitive price.